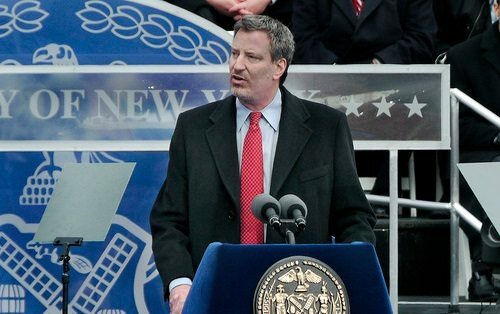 According to Angelo Falcón, the president of the National Institute for Latino Policy, New York City Mayor Bill de Blasio will be attending the annual Somos el Futuro fall conference in Puerto Rico, just as he did was he was mayor-elect. Now simply called SOMOS, this annual conference has been held since 1988. Some call it a political junket; others suggest it serves to present the concerns of New York’s Puerto Rican legislators. When de Blasio attended the fall SOMOS conference last year, the mayor was facing criticism from the Campaign for Fair Latino Representation that his lineup of appointments was thin on Latinos. Early on, de Blasio made some high profile Latino appointments, including by Falcon’s count Lilliam Barrios-Paoli, the deputy mayor for health and human services; Carmen Fariña, the schools chancellor; and Gladys Carrión as Administration for Children’s Services (ACS) commissioner, adding up to 26 percent of the mayor’s publicly announced appointments. Since then, Falcón reports, the Latino percentage of de Blasio’s known appointees has fallen to only 12 percent. While Falcón doesn’t argue for exact one-to-one proportionality, he notes that such a low proportion is troubling for a city in which one out of three residents is Latino. A politician’s roster of appointees is often influenced by the pressure he or she gets from political peers. Falcón admits as much: “Another problem in bringing this issue to the fore is that Latino members of the New York City Council and the media have not taken this concern seriously.” In Falcón’s view, de Blasio has made strides to diversify city government staffing with the recruitment of blacks, Asians, and women, but Latinos are lagging.